On December 22 I will have had Olive for six months. SIX MONTHS! I really can't believe it. I remember when Megan & I drove her home, Olive nestled soundly on top of the blue blanket that rested in Megan's lap. It's been six months since I brought her home and so much has changed since I adopted her. I remember feeling incredibly scared later that night, not knowing what I had gotten myself into - swearing there was no way I'd be able to provide for this bunny, to make her feel safe and happy. I was terrified. And I know what you're thinking, that I sound like a mother who had just brought her child home for the first time and you're right because Olive is my baby. 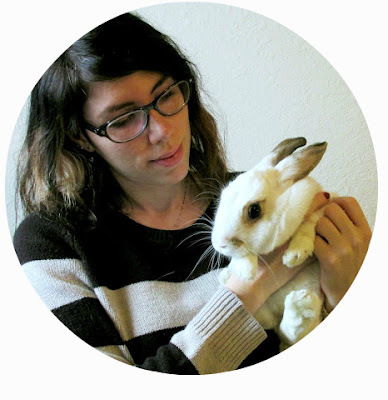 Something shifted within my heart when I saw her at the Gainesville Rabbit Rescue. I was nervous to pick her up and hoping she would like me enough to want to come home with me. Next thing I know she's crawling into the pet carrier I had brought for her. She was ready to go home and with me no less! Over the past six months I have watched Olive's personality flourish and I am so glad to have such a sweet, affectionate bunny. Every once in awhile I think about how her life was before she was rescued by GRR and it brings a grateful tear to me eye knowing that Kathy and her incredible staff was there to save her from that hoarder house in Georgia. While on the other hand, it makes me so sad to think that Olive was ever alone, scared or neglected. But things are good for her now and I can tell by the way she cuddles with Alex & I and the way in which she does her "happy bunny dance/hop" across the floor.